You’ve either lived in Bangalore your entire life or just arrived to India’s Silicon Valley – quite sure both have not paused and taken a breather from the hectic life to look around this beautiful city. Either way, we think that in 24 hours (or rather 12 hours of daylight), you can get the best this city has to offer. So text all your friends, fuel up your bikes or cars because we have created this exclusive one day itinerary that will help you appreciate Bengaluru in its truest sense. Yes, we have factored in traffic situations as well. From gardens and pubs to palaces and dosa, set 12 hours on the clock and GO…. You can walk out through the main entrance of Lalbagh and head to Mavalli Tiffin Rooms (MTR). Gorge on those delicious rava idlis or ghee masala dosas and end your breakfast with a cup of piping hot filter coffee, naturally! If you have already eaten at MTR, hit up Brahmins Coffee Bar, only just 15 minutes away. Feast on idlis, vadas, kesari bath, khara bath, coffee and tea. And mind you, don’t ask for sambar, they don’t have any! Start off your morning bright and early (6am to 9am is free entry) for a stroll through Lalbagh Botanical Gardens. Walk in through any of the four entrances and let yourself be one with nature; take in the view of the lake with egrets flying off the backs of lily pads. If photography is your thing, bring your best lenses along to capture the beautiful vistas that a garden can offer. Laugh along with the retirees who’ve come there do some laughter Yoga and feel completely refreshed and energized to begin your adventure for the day. There’s also a lovely rock you can run up and down, plus, a pond to do some bird watching at. This temple is one of the oldest temples in Bangalore and the biggest tourist attractions; you might’ve always had Dodda Ganapathi temple on your list but never been able to make it, so today is the day! A stone carved to a normal sized Ganesha idol rumoured to have grown to the height of 18 feet, was laid in Basavanagudi almost 500 years ago. You will be awed at the sheer size of it! Climb up the hill a little further, you will find Lord Nandi (vehicle of Shiva) at a whopping 15 feet, adorned with garlands and headdresses. Then head to the Bugle Rock Park estimated to be 3000 million years old. In the centre of a park in a watchtower that is atop a hill, apparently it served as the southern helm of the Bangalore city. It is almost lunch time and if you are looking for a sumptuous meal, go no further than Kamat restaurant that is less than a kilometre from Dodda Ganesha temple. Do not even look at the menu card, just tell them to serve you the special meals that include unlimited jolada rotti (jowar roti), rice and a wide variety of side dishes and finish the meal off with holige and a huge serving of ghee. After all, you are going to make up for all the energy you’ve lost seeing all those sights and you are going to need sustenance to continue on with your discovery of Bangalore. We may have been a small, rather nondescript town, till much after Independence, but that doesn’t mean we don’t have our history! You can acquaint yourself with the city at the 16th century Bangalore fort. To make the most of your trip here, you can also check out Tipu Sultan’s Summer Palace that is a short walk from the fort. Over at Tipu’s Summer Palace, you’ll gain plenty of insight into Tipu’s life and Indo-Islamic architecture while snapping up Insta-worthy pics. Over to more palace…Ask anyone who’s lived in Bangalore for a long time; they know a palace exists but they’ve probably not been there! So take them along, and head to Palace Grounds, that most Bangaloreans have gone to only for rock concerts, fairs or even your friend’s lavish wedding. From its ornate cornices to its sturdy granite exterior, the Bangalore Palace has a sprawling garden and one look from the outside with teleport you to one of the palaces in England. In fact, it is modelled on the Windsor Castle. Dotted with several paintings of Raja Ravi Varma, photographs chronicling the different Wodeyar families, the Bangalore Palace gives you a true sense of belonging to the city of Bangalore. Walk across to NGMA from the other gate of the palace to see India’s most-renowned painters and its budding talent of edgy artists. The stunning Manikyavelu Mansion, in Vasanth Nagar, houses the National Gallery of Modern Art (NGMA). Here, you can walk through pristine galleries showcasing the work of the country’s greatest artists from Abanindranath Tagore to MF Hussain and Raza. In the recent past, Bangalore’s flyovers and buildings have served as canvases to upcoming street artists that to the St+Art festival. And you can check out their works here. We’ve started calling the centre of town CBD even though it may not really be the Central Business District. When here, hit up Lakeview Milkbar to gorge on gooey delicious Hot Chocolate Fudge. Around for over 50 years, it’s tradition to chill out here, so don’t break tradition. It’s now also become tradition to take it “to go”. You need to then cross the road and walk on the charmed Metro Boulevard to enjoy the bougainvillea trees and art work poured on walls by local artistes. 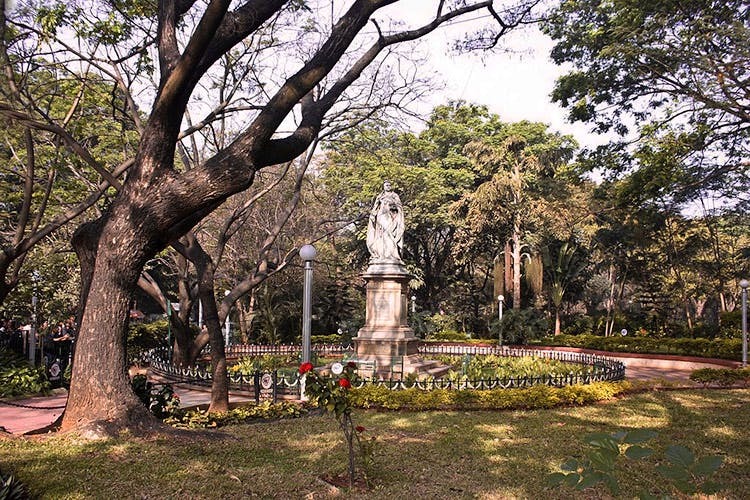 Walk a little further to run over to Cubbon Park, for some chilling. There’s also a logo of Bangalore City to see at the park, as well as at your next stop, Parliament House. Head back into the city and drive by the centre of Bangalore’s government headquarters: Vidhana Soudha. Built in the 1950s, the building stands majestic with lawns and wide roads to match the glory of it. Turn your head another 180 degrees to see the Court House in bright brick red that will give you sense of pride while riding/driving along these wide roads irrespective of who’s ruling the state. Not that we’re pleased with the current political affairs! It looks gorgeous at sunset. A day in Bangalore is not complete without beer, and Bangalore’s drink of choice is, undoubtedly, the beer. Pick from the craft breweries that includes the likes of Toit and Arbor Brewing Company. Or if you just want draft, go to one of the beer pubs where you can tank up on pitcher after pitcher.